A parliamentary report of 1777 recorded parish workhouses in operation at Ayott St Peter's (for up to 4 inmates), Digswell (9), and "Wellwyn" (8). 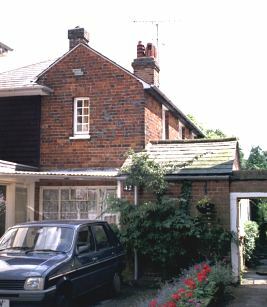 Welwyn's original parish workhouse was located "in a corner of the churchyard" (Hill, 1965). A new parish workhouse was built in 1830 on London Road. County of Hertford: Ayot St Lawrence, Ayot St Peter, Digswell, Welwyn (2). The population falling within the Union at the 1831 census had been 1,970 with parishes ranging in size from Ayot St Lawrence (population 134) to Welwyn itself (1,369). The average annual poor-rate expenditure for the period 1831-34 had been £1,037 or 10s.6d. per head of the population. With only five Guardians on its Board, and less than 2,000 inhabitants in its catchment area, Welwyn was possibly the smallest union in the country. The new union took over the existing Welwyn parish building for use as the Union workhouse. It could accommodate about sixty inmates. A small infirmary was added at the north of the workhouse in 1880. Its location and layout are shown on the 1898 map below. 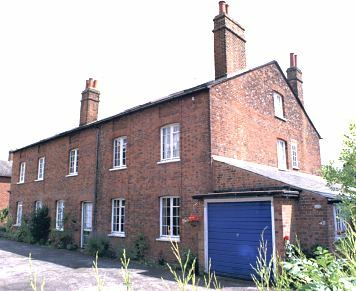 Welwyn workhouse from the south-east, 2001. Welwyn infirmary block from the west, 2001. By the early 1900s, the Welwyn workhouse had a reputation as operating a fairly generous regime for its inmates. This was, perhaps, because the town received a high proportion of its rates from railway companies rather than private householders. The Royal Commission looking at Poor Relief in 1906-9 heard that the workhouse was a small place, rather like an almshouse, with 17 inmates in residence. Each day 17.5 pints of beer were served, each person receiving it (as regulations required) under doctor's orders. In 1907, James Henry Hill and his wife Lizette were appointed as master and matron of the workhouse. A portrait of life in the institution during their tenure was later compiled by their daughter, Meta (Hill, 1965). She recalled that the building included a men's block (three bedrooms and a day room), a women's block (one large bedroom, washroom and toilet, and a day room), a children's block (one large bedroom and a dayroom), the officers' quarters (three bedrooms, offices, dining-room, needle-room), the kitchen, wash-house with bath, wash-room, with copper, and the infirmary. There was also provision for housing up to eight male and six female 'casuals' each night. If any more arrived, the men were placed in a room at the Railway Tavern, with women sleeping on the workhouse floor. Male inmates, both permanent and casuals, were mostly employed in chopping wood which was sold in bundles in the local area. Breakfast (7am) Bread, margarine, tea. Beever (For those who worked, 11am) Bread, cheese, beer. Dinner (noon) Sunday: hot meat, veg. ; Monday: soup, rice pudding; Tuesday: boiled bacon, peas; Wednesday: meat puddings, potatoes; Thursday: savoury dish; Friday: fish, rice pudding; Saturday: varied. Tea (6pm) Bread, margarine, tea; cake twice a week; jam twice a week; biscuits for children. During the First World War, the workhouse was used to billet twenty-five soldiers, with an additional twenty-five having their meals there. During this period, the normal workhouse inmates were housed in the infirmary. Welwyn Poor Law Union was dissolved in 1921 and the workhouse was then used as a children's home for the Hatfield Union until 1924. The buildings have now been adapted for residential use. Hertfordshire Archives and Local Studies, County Hall, Pegs Lane, Hertford SG13 8DE. Holdings include Guardians' minute books (1905-21); Births (1906-16); Deaths (1907-21); Admissions (1910-21); etc. Hill, Meta (1965) The Last Days of the Welwyn Workhouse in Hertfordshire Past and Present, No.5. pp.20-24.